Happy Saturday - I hope you are all having a lovely weekend so far! 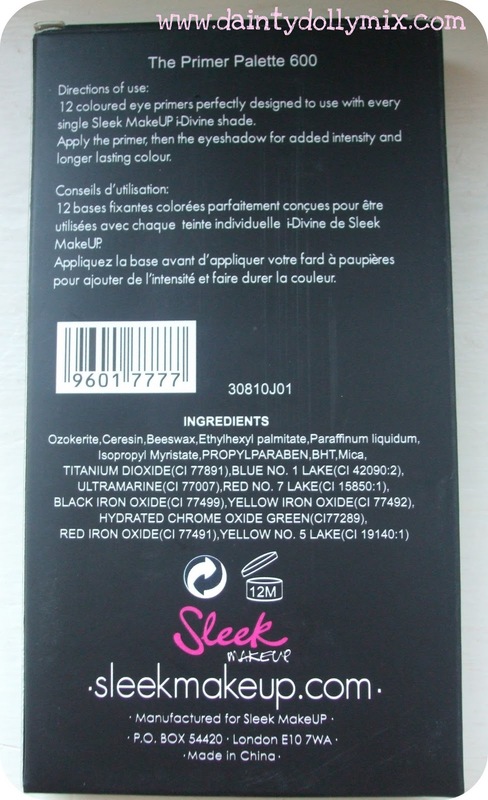 Today we have another new addition from Sleek MakeUP is the i-Divine: Primer Palette. 'Take you eye-shadow to new levels of intensity with Sleek MakeUP's new wonder product: i-Divine: Primer Palette. Specially designed to work with your current collection of eye-shadows, it has become a make-up artists secret weapon to powerful colour that lasts all day long. The different coloured eye primer palette will ensure your eyes have the perfect base for amazing colour, whether it is bold blues, creamy champagnes or slick silvers your make-up routine will change forever after just one application. The long lasting formula of Sleek MakeUP's i-Divine Primer Palette is like no other eye-shadow base. Each of the 12 creamy shades is highly pigmented to breathe a new lease of life into your existing eye make up. Opt to trend-led block colours or experiment by mixing two shades together. The super smooth texture glides on to the eyelides effortlessly without creasing, making it the perfect base for your favourite shade. Apply make-up like a pro by using the soft brush included. Sweep your chosen shade and apply to the eyelids. Immediately apply your chosen eye-shadow for an impressive colour that will last'. I actually first saw this primer palette at IMATS and the stand was that hectic that i didn't bother to purchase but afterwards i was a bit disappointed with myself that i didn't! So i am very happy to now have it in my possession! I have seen other blog posts & swatches of this palette that have said the palette comes with colour names although mine doesn't, so unfortunately i cant give you any colour names! The colours are creamy and well pigmented. I especially love the colours in the bottom role as they are more neutral and wearable for me, i love the shimmery peach, gold and brown colours which i think i will get a lot of wear from. The Sleek MakeUP i-Divine Primer Palette launces in Superdrug and on the Sleek MakeUP Website on the 16th February and will retail at £6.99. Will you be picking up the Sleek MakeUP Primer Palette? ooh! i'll defo be purchasing this palette, looks brilliant. This is a great palette but I don't think I would use the brighter colours. The neutrals are really pretty but when would you wear the blue or red base? I was wondering do they crease? A Night With Jason Derulo & Meeting Shontelle!